(CNN) -- A Nestle plant linked to an outbreak of illness has been shut temporarily, and the company said Monday that it expects to lay off more than 200 workers as a result. Preliminary results "indicate a strong association with eating raw prepackaged cookie dough," the CDC says. "It's likely that we're going to have some temporary layoffs at that facility," Nestle spokeswoman Roz O'Hearn said of the Danville, Virginia, facility that was churning out refrigerated cookie-dough products until Thursday. About 550 people work at the factory, but only about half of them work on cookie dough, she said. The rest work on Buitoni pasta and sauce in a separate facility at the plant. She said there is little chance that the Buitoni products might be tainted, because -- even if the cookie dough is proved to be the source of the outbreak of E. coli 0157:H7 -- it is a kosher product, meaning it is made from a segregated stream of ingredients. Danville's Economic Development Office said the city's unemployment rate is 14.3 percent. Nestle was first alerted to the problem late Wednesday by the Centers for Disease Control and Prevention and the Food and Drug Administration, O'Hearn said, adding: "Less than a day later, we made the decision to remove the product. We shut down. We stopped shipping." Included in the recall are 300,000 cases of the product. Each case contains 12 packages, and each package contains 24 cookies. That's a total of 86.4 million cookies' worth of dough. The recall does not include Dreyer's or Edy's ice cream products with Nestle Toll House "cookie dough" ingredients. That's because the "dough" in ice cream is not really dough at all; it is cooked. "Ice cream is a different formulation," O'Hearn said. "Since it's not meant to be baked before consumption -- those cookie crumbles that are in the formulation -- they're all cooked. For the cookie dough that's present in the ice cream, Dreyer's is using heat-treated ingredients." According to the CDC, between March 1 and Monday, 70 people in 30 states had been infected with a strain of E. coli. The ages of the people affected ranged from 2 to 57 years, though more than 70 percent were younger than 19, and 75 percent were female, the agency said on its Web site. Twenty-five people had been hospitalized, and seven had developed a kidney failure called hemolytic uremic syndrome. No fatalities had been reported, it said. "Preliminary results of this investigation indicate a strong association with eating raw prepackaged cookie dough," the agency said. "Most patients reported eating refrigerated prepackaged Nestle Toll House cookie dough products raw." Though cooking the product would kill the bacteria, the agency did not recommend that people holding on to the company's cookie-dough products do so, "because consumers might get the bacteria on their hands and on other cooking surfaces." 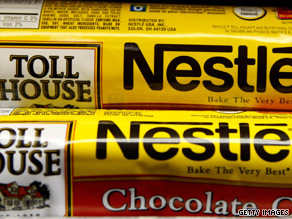 The recall does not include Nestle Toll House morsels, which are used as an ingredient in many homemade baked goods, or other baked cookie products. CNN's Louise Schiavone contributed to this story.